Loxodonta cyclotis, the African forest elephant, is considered a necessary part of the ecosystem that is the forests of Africa, the keystone (Blake et al., 2009). Without the forest elephant there would be a great decrease in the diversity of trees. 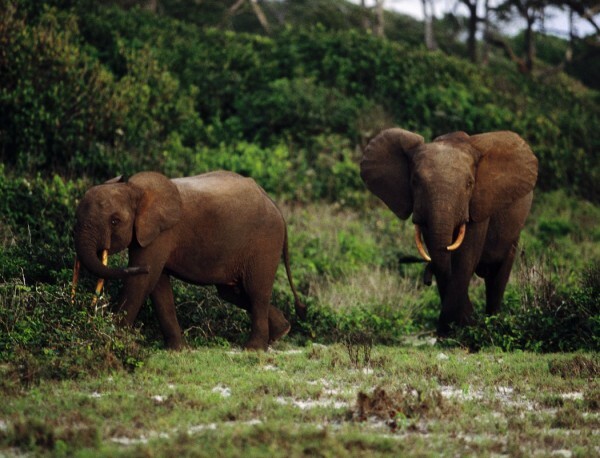 But the forest elephants are continuously at risk of being hunted and killed for their ivory. 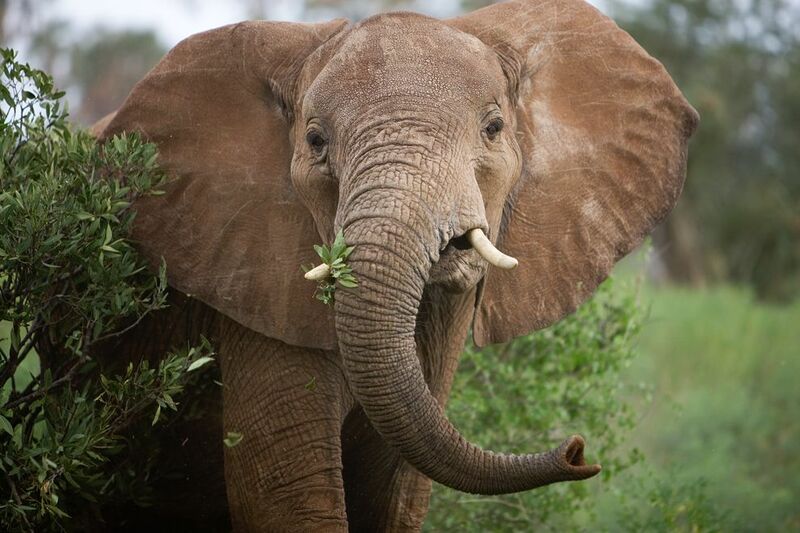 Loxodonta cyclotis have a mutualistic relationship with the trees surrounding them. This relationship exists because forest elephants eat trees to sustain their large body mass and to fuel them in their journeys, while trees benefit in a slightly less direct way. Trees benefit from their seeds being eaten by the forest elephant. While in the elephant's stomach the seeds begin to germinate. This is because the acidity of the forest elephant’s gut helps in the germination process of the seed, since nearly all of the seeds that reenter the world, after being inside the elephant, are ready to sprout into trees (Beaune, 2013). When the seeds are released from the forest elephant's body with its dung, having gone through days’ worth of travel in the elephant’s gut, the seeds are large distances away from where they were consumed and are ready to grow. It is for this reason that Loxodonta cyclotis are the largest contributors to the dispersal of seeds. The larger the seed ingested by the elephant the longer it takes for the elephant to disgust and the farther away the seed can be carried by the elephant. The time that a seed remains in the elephant’s gut is directly related to the size of the seed when it is ingested. So a smaller seed would take about a day to pass through an elephant’s system while a large seed could take over three days before it is released to begin growing (Blake et al., 2009). Because forest elephants have such large guts they need lots of nutrients to sustain them, but most of the time they cannot accomplish obtaining all of this food in one area so they must travel large distances to these nutrients. This need to obtain food can cause Loxodonta cyclotis to travel about twenty-four miles in a day (Granli and Poole, 2008). Once a new population of seeds is dispersed by the African forest elephants the seeds can then grow into a tree and disperse its own seeds through gravity and wind and being eaten by small herbivores and omnivores until the elephant comes through again to carry the seeds away to start another new population far away (Blake et al., 2009). Within their three day time that their gut can take to send the seed through, from mouth to tail, an elephant can travel a maximum of fifty-seven kilometers (Blake et al., 2009). By this understanding, Loxodonta cyclotis can dispense seeds farther than any other form of dispersal, making them essential for the forest to survive. Loxodonta cyclotis have a parasitic relationship with humans, well technically the parasitic one is the human. This parasitic relationship exists because humans have been hunting and killing forest elephants, poaching them, to collect their tusks for ivory and the rest of the elephant’s body is used for its meat. Of course neither of these reasons for hunting forest elephants is beneficial to the forest elephants themselves, which is the reason they now have a much smaller population than in the past, making them endangered. Humans are the main threat to the forest elephant's existance because other than Panthera leo 'Lion' and hyenas, who only go after baby elephants, humans are their only preditors (African Forest Elephants, 2008). It is likely if the poaching continues not only will the African forest elephants be extinct, but so will the trees that are helped because of them and the trees that they maintain, disperse seeds for.